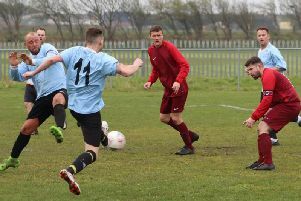 The rain gave way to frost last weekend but some great football was still played in the Blackpool and District Youth League. The U7s played in some lovely sunshine and all enjoyed being able to show how they have developed. The U11’s all played development matches and again showed the improvements in both skills and match play. On Saturday, in the U13s, Warton Typhoons took on top-of-the-table Poulton Town. The spectators were treated to a great match with Warton competing for every ball and never giving up. Poulton showed why they are top and proved too strong in the end, winning 3-1 with their goals coming from Sean Davies-Ward, Thomas Powl and John Bull. Sunday saw another frosty day but some fixtures were still played. In the U14s’ division the Hogan Cup started and the two matches were a contrast. Squires Gate Titans played Kirkham Juniors Blues with Kirkham 8-0 winners. In the other match Lytham Juniors Blues played Thornton Cleveleyes White, who took a 3-0 lead at half-time before the Blues came back with three in the second half. The match went to penalties which ended 3-2 to the Thorton Cleveleys Whites; read more on pages 24-25. In the league, second-placed Foxhall Juniors played a Poulton FC team in fifth. This was expected to be a great match and so it proved with both sides going all out for the win but ,in the end, they settled for a 3-3 draw. Poulton’s goals came from Nico Cobb, Sol Mattatia and Aaron Pope, while Foxhall’s were scored by Connor Satchell (2) and Aidan Wright. FC Rangers Blues played Squires Gate Reds, who came out 6-3 winners with Karl Pacheco and Anthony Cantley both getting a brace and Cian Turley and Filip Czarnecki getting a goal apiece. This moves Squires Gate Reds up into second place and FC Rangers Blues stay fourth. The U18s’ division saw AFC Blackpool travel to Boundary Park to play FC Rangers. AFC proved far too strong and came away with three points to move top of the division. In the other match Staining Juniors beat Kirkham Juniors courtesy of Joe Murray (2), Matt Webster (2), Joel Heaton, Marty Holdip and Patrick Valentine. YMCA were made to work hard for this victory. They enjoyed much of the early possession without creating any real clear chances, mainly due to committed defending. Town always looked lively on the break but the half ended goalless. YMCA began the second half as they started the first and were rewarded when Owen McConnell’s corner was deflected in. YMCA remained on the front foot and Thomas Shuttleworth doubled their lead with a well-taken goal before sealing the issue by bagging his second in clinical style. YMCA played hosts to Poulton and, despite the recent bad weather, the pitch was in magnificent condition. They started brightly only to see a goal disallowed for offside. However, they continued to press forward and went 1-0 ahead through Jacob Grice. They doubled their lead when a neat cross from Jack Robinson found Jay Aspinall, who volleyed home. YMCA increased their lead further when Josh Dalby Armstrong met a cross and finished accurately before Lucas Miller made it 4-0. After the restart YMCA remained in control but without taking their chances until a through ball led to Wes Bajraliu finding the target to complete victory. Blackpool were forced to dig deep to overcome a resolute Maghull side in this West Lancashire Girls League fixture. The deadlock was broken late in the first half , when Blackpool’s player of the match, defender Yulan ChanDelaney, won possession and played the ball into the path of Izzie Maude on the right. Her shot was saved but Alicia Trewin followed up to fire home before Blackpool scored again in the second half through Molly Grove. YMCA produced an excellent performance to claim all three points at Seafield Road. Midway through the first half, YMCA were caught on the break and the visitors scored to take a 1-0 lead. YMCA were on level terms when Annabelle Jackson found Ellie McNally who made no mistake to equalise. The roles were reversed when McNally struck the post and Jackson was on hand to score the rebound and give YMCA a 2-1 lead at the break. Darwen equalised soon after the restart but the outstanding Jackson restored YMCA’s lead from a McNally corner before completing her hat-trick with another fine finish. McNally capped off an excellent performance with another goal to make it 5-2 before the visitors caught out YMCA with their third. YMCA grew stronger as the visitors began to tire and Isabelle Kells completed the scoring with two goals. Despite the very cold conditions YMCA produced a gutsy display last Sunday. The first half was evenly contested but YMCA began to take the initiative and Libby Chandler put them ahead. Shortly after, Anya Dewin doubled their lead and YMCA reached half-time 2-0 ahead. Ribbleton had more of the play with the stiff breeze behind them in the second half and they pulled a goal back. YMCA then had to withstand some late pressure as the home side sought an equaliser but, with some solid defending, they kept their narrow lead.